tags: Amegilla sp., Black Spider Wasp, Blue-banded Bee, Chequered Cuckoo Bee, Fabriogenia sp., Gasteruptiid Wasps, Gasteruption sp., Thyreus sp. 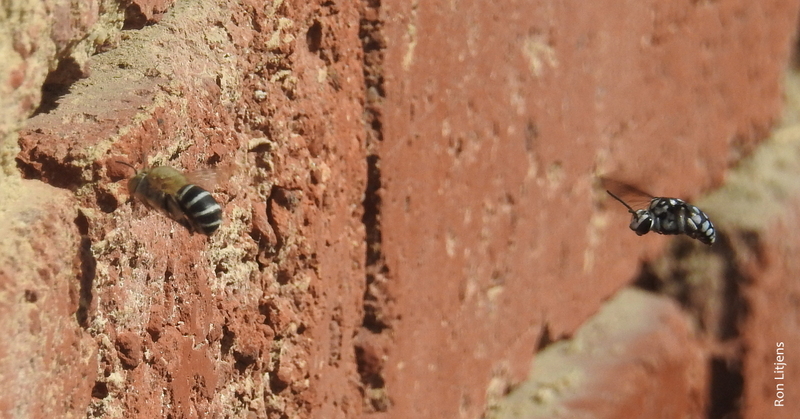 The last blog described an external wall of our house where dozens of female Blue-banded Bees (Amegilla sp.) had made their nests by burrowing into the friable lime mortar. At the end of each burrow is a cell in which an egg and a food supply of pollen (for when the egg hatches) are sealed. Watching the bees come and go has been fascinating (better than the TV) but in doing so we have noticed a number of other insects loitering outside. 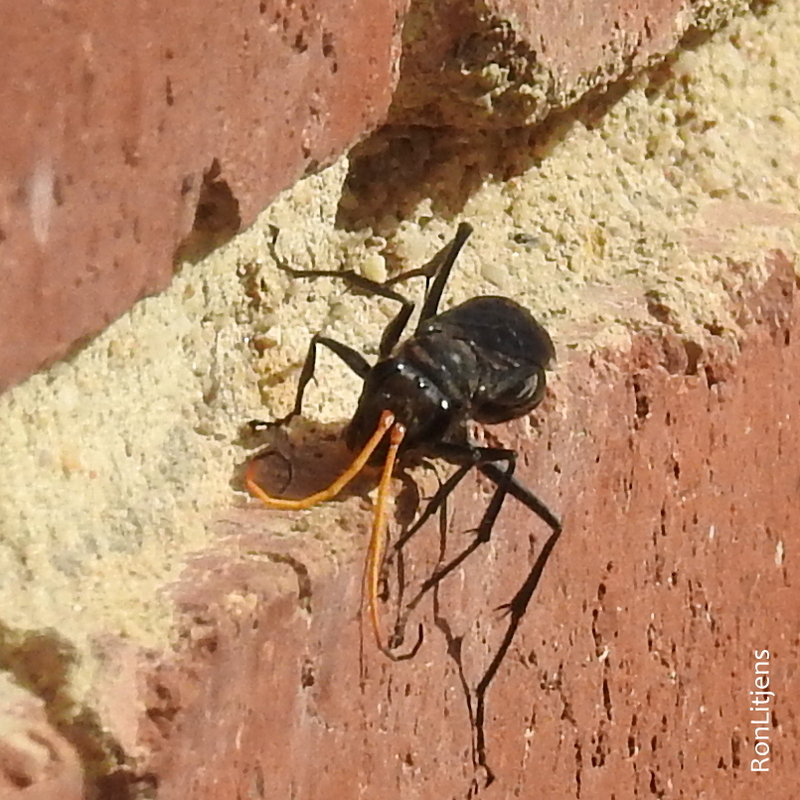 Black Spider Wasps (Fabriogenia sp. ), pictured above left, have been searching all the nooks and crannies in the mortar to locate spiders which they detect by tapping their orange antennae on the surface. Once located the wasp immobilises the spider and takes it away to the nest where it lays eggs on it (see previous blog). More troubling from a Blue-banded (BB) Bee point of view is the presence of Chequered Cuckoo Bees (Thyreus sp. ), pictured right. 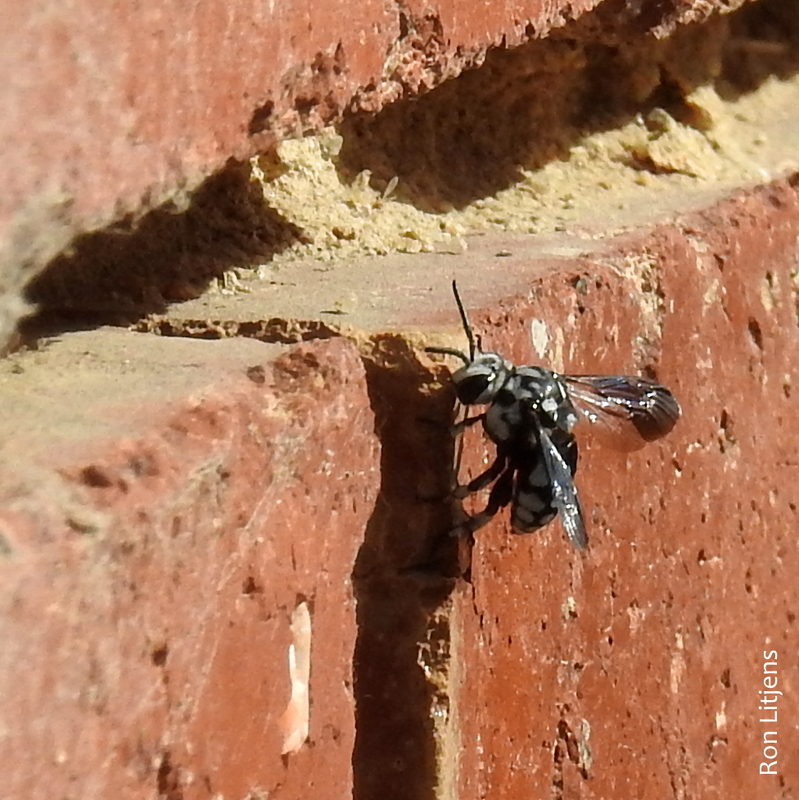 Cuckoo bees do not build nests. Instead they wait until a Blue-banded Bee has just about finished loading the cell with pollen and then while the BB Bee is away they lay their own egg inside the cell. If the cuckoo bee larva hatches first it will eat all the food and the BB Bee larva will starve. And if that wasn’t enough, Gasteruptiid Wasps (Gasteruption sp.) (pictured left) are also checking out the BB Bee nests when the bees are away. Adult wasps are nectar feeders and can be seen buzzing around flowers in summer. 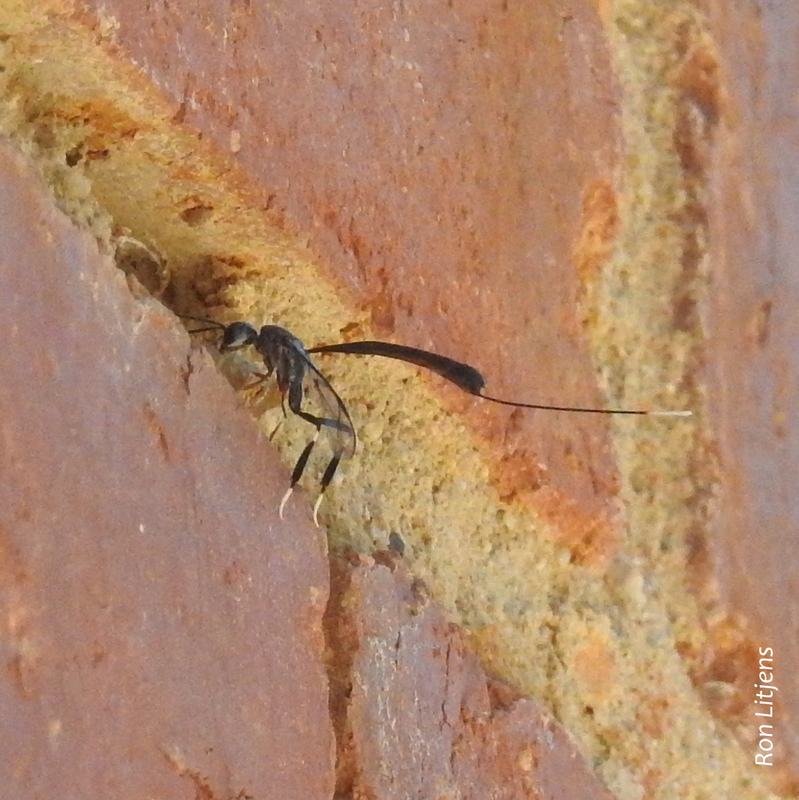 The female wasps of this type oviposit an egg into the BB Bee nest cell. When the wasp larva hatches it consumes the bee egg or larva and the stored pollen. This is called kleptoparasiticism. They say that you can’t choose your family but you can choose who you mix with…unless they follow you home. Ron, these are some of your most wonderful photos. The photo of the cuckoo following the host into the nesting hole – that must have taken hours of patient waiting or a good deal of luck! The information is astonishing. Well done and thanks for sharing!